Nakahama John Manjiro, photograph circa 1880. 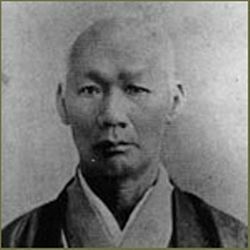 Nakahama Manjirō (中濱 万次郎 Nakahama Manjirō) (1827 - 1898), also known as John Manjiro, was one of the first Japanese people to visit the United States and an important translator and adviser to the Japanese government during the late Tokugawa and the early Meiji periods, when Japan opened its ports to American trade and expanded its commerce with European traders. During this period, Japan began an intensive program of modernization. When he was 14 years old, he was shipwrecked along with four other fishermen from Tosa Province, Japan, and rescued by the American whaler USS John Howland, commanded by Captain William H. Whitfield. Whitfield befriended the boy and took him home to Fairhaven, Massachusetts, where Manjiro spent three years studying English, mathematics, history, geography, navigation, and shipbuilding. After working on another whaling ship and in the California Gold Rush, Manjiro risked execution to return to Japan, by Japanese law at that time, where he became a teacher. 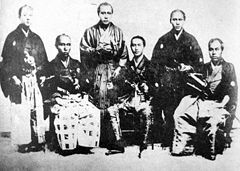 In 1853, when the United States Navy fleet led by Commodore Matthew C. Perry anchored in Edo harbor, Manjiro was summoned to Edo and given the rank of samurai. He was installed as an interpreter and translator for the Tokugawa shogunate and was instrumental in negotiating the Convention of Kanagawa. In 1860, Nakahama Manjiro participated in the Japanese Embassy to the United States. Later, during the Franco-Prussian War in 1870, he studied military science in Europe. When the new Meiji government established Kaisei College in 1877, the forerunner of the University of Tokyo, Manjiro joined the faculty and helped educate Japan's future leaders. Manjiro's descriptions of his travels painted a new picture of the United States for the late Tokugawa and early Meiji eras. He helped to dispel many misconceptions, and especially devoted himself to teaching his countrymen about American democracy, independence, freedom, and equality. Manjiro is believed to have influenced the architects of the Meiji Restoration and the modernization of Japan. After issuing edicts to expel all Portuguese missionaries and traders from Japan in 1639, the Tokugawa shogunate enforced kaikin (海禁, "maritime restrictions"), a series of restrictions intended to carefully control Japan’s contact with foreigners. The Dutch East India Company was permitted to continue commerce in Japan from a trading post on the small island of Dejima, separated from the city of Nagasaki by a small strait; foreigners could not enter Japan from Dejima, nor could Japanese enter Dejima, without special permission or authority. Japanese were not allowed to travel abroad, on penalty of death. Through the Dutch at Dejima, the Japanese received some knowledge of Western science and military technology. New England whalers began arriving in the coastal waters north of Japan as early as 1791, and during the same period the growing volume of shipping in the Pacific and the South China Sea brought increasing numbers of American merchant ships into the waters between Japan and China. Their presence resulted in a rise in the number of ships visiting Japanese shores in search of food and water, and led to an increase in the number of shipwrecks in the area. Japanese leaders viewed these incidents as intrusive. In 1825, the Mito scholar Aizawa Seishisai wrote Shinron ("New Proposals"), an influential document warning that Japanese weakness for "novel gadgets" could "lure ignorant people" to the spell of "treacherous foreigners," and urging the shogun to "smash the barbarians whenever they come in sight." He argued that foreign trade was injurious to Japan and that contacts with foreigners would undermine Japanese morale or worse, lead to outright foreign conquest. The Tokugawa shogunate responded by issuing an edict in 1825, that ordered the forcible ejection of all foreign ships from Japanese coastal regions and the destruction of foreign intruders with "no second thought." When a foreign ship attempted to return shipwreck victims to Japan, the government would either drive the vessel away by shelling it, or accept the survivors and execute them for violating the national ban on foreign travel. In 1837, when a small group of American Protestant missionaries based in Canton tried to return seven Japanese castaways to Japan, their small, unarmed ship was fired upon at the entrance to Edo Bay, and again at the port of Kagoshima in southern Kyushu, forcing them to retreat with the Japanese still on board. After the United States acquired California and Britain gave up the Oregon territory in 1846, it became increasingly interested in trade with Asia. In 1852, the influential southern journal De Bow's Review predicted a potential annual trade market in Japan worth $200 million. A first U.S. attempt to establish official contact had been rebuffed in 1845. In 1853, the United States sent Commodore Matthew Perry with a fleet of U.S. Navy ships to demand that Japan open its ports to trade with the United States. Nakahama Manjiro's report of his travels, 1850s, Tokyo National Museum. Manjiro Nakahama was born in the village of Naka-no-hama, Tosa Province (now Tosashimizu, Kōchi Prefecture), Japan, in 1827. In 1841 he and four fellow fishermen were caught in a storm at sea and shipwrecked on the deserted island of Torishima. Nearly six months later, the American whaler ship John Howland, commanded by Captain William H. Whitfield, rescued them. Over the next six months, as the ship continued to hunt whales in Japanese waters, Manjiro Nakahama began to learn English and to assist the whalers. Captain William Whitfield took a strong liking to the eager young man. When they reached Hawaii, the other four Japanese were left with officials in Honolulu; Nakahama, now known as “John Manjiro” (nicknamed "John Mung"), wanted to stay on the ship. Captain Whitfield took him back home to Massachusetts, and treated him as a son. He lived at the Whitfield family's single-story home at Number 11 Cherry Street, Fairhaven, and was entrusted to James Akin, who enrolled Manjiro in Oxford School in Fairhaven. He learned how to read and write English and studied mathematics, history, and geography. He also studied surveying the Bartlett School of Navigation, and became familiar with Bowditch's American Practical Navigator, which he later translated into Japanese. He was apprenticed to a cooper, and learned to make barrels to hold whale oil. Three years after arriving in Fairhaven, with Captain Whitfield's help, John Manjiro signed on to the whaler Franklin under Captain Ira Davis, bound for the rich fishing waters off Japan. After whaling in the South Seas, Franklin put into Honolulu in October 1847, where Manjiro again met his four friends. None had been able to return home, because leaving Japan was an offense punishable by death. When Captain Davis became ill and was left in Manila, the crew elected a new captain and Manjiro was made First Mate. Franklin returned to New Bedford in September 1849 and paid off; Manjiro, with $350 in his pocket, was now self-sufficient. Manjiro promptly set out by sea for the California Gold Rush. He arrived in San Francisco in May 1850, and took a steamboat up the Sacramento River, then a train into the mountains. In a few months, he had made about $600 and decided to find a way back to Japan. After his experiences sailing around the world, Manjiro believed that the Tokugawa shogunate’s policy of isolation was irrational, and that it would serve Japan's best interests to open a port in Satsuma Province in southern Kyushu or in the Ryukyu Islands to accommodate American whaling vessels. He decided to make a personal appeal directly to the Shogun. Manjiro arrived in Honolulu and found two of his shipwrecked companions who were willing to go with him. With the help of Reverend Damon, he purchased a whaleboat, the Adventure, which was loaded aboard the bark Sarah Boyd (Captain Whitmore) along with gifts from the people of Honolulu. They sailed on December 17, 1850, and reached Okinawa on February 3, 1851. The three were immediately arrested for violating Japan's exclusion law, and were taken to Kagoshima for questioning by Lord Shimazu, the daimyo of Satsuma. Curious about their travels, Lord Shimazu protected them and saw that they were treated with courtesy. After months of interrogation in Satsuma and Nagasaki, they were released and returned home to Tosa where Lord Yamanouchi Toyonobu questioned them further before awarding them pensions. Manjiro returned to his village of Naka-no-Hama and was reunited with his mother on October 5, 1852. Yamanouchi Yodo, the Lord of Tosa, prohibited Manjiro from ever leaving his home town "for travel abroad, needless to say, and for ocean-bound fishing journeys." On October 8, Lord Yamanouchi appointed Manjiro a teacher at the Tosa School, where he became a valuable source of information on Western politics and philosophy, technology, and navigation. Manjiro detailed his travels in a report to the bakufu, which is kept today at the Tokyo National Museum. After Commodore Matthew Perry's Black Ships arrived to force the opening of Japan, Manjiro was summoned to Edo (now known as Tokyo) in September 1853, questioned by the national government, and made a hatamoto (a samurai in direct service to the shogun) and a government adviser. As a token of his new status, he was allowed to wear two swords and adopt a surname; he chose Nakahama, after his home village. Manjiro, though unseen and unknown by the Americans, became an interpreter and translator for the Tokugawa shogunate and was instrumental in negotiating the Convention of Kanagawa. He told the shogunate, "America greatly hopes to enjoy a deep and abiding friendship with Japan. America does not come with suspicious designs but with a full and open heart." Members of the Japanese delegation to the United States in 1860, who sailed on the Kanrin Maru and the USS Powhatan. In 1860, Nakahama Manjiro participated in the Japanese Embassy to the United States. He was appointed translator on board Kanrin Maru, Japan's first screw-driven steam warship, purchased from the Dutch. The crew had little experience on the open sea, and during a storm, her Captain Katsu, Admiral Kimura, and much of the crew fell ill. Manjiro was put in charge and brought the ship to port safely. In 1870, during the Franco-Prussian War, Manjiro studied military science in Europe. He returned to Japan by way of the United States. He was formally received at Washington D.C., and he traveled overland to Fairhaven, Massachusetts, to visit his "foster father," Captain Whitfield. Upon returning to Japan, Manjiro led the Ogasawara Islands surveying teams on behalf of the shogunate, lectured at the Naval Academy, taught English, mathematics, navigation, and shipbuilding at the Satsuma Kaisei School, and again became instructor at the Tosa School. He was made curator of the scientific apparatus brought from the United States. Nakahama was made a captain in the Imperial Navy, and built various smaller craft on American models. When the new Meiji government established Kaisei College (the forerunner of the University of Tokyo), Manjiro was brought there as a professor to educate and train Japan's future leaders. Manjiro died on November 12, 1898, and was interred in Zoshigaya Cemetery Toshima-ku, Tokyo. Manjiro apparently contributed to the Japanese government’s efforts to build a modern Navy with his knowledge of Western shipbuilding. He translated the 20-volume Bowditch's American Practical Navigator into Japanese, and taught English, naval tactics and whaling techniques. He allegedly contributed to the construction of the Shohei Maru, Japan's first post-seclusion foreign-style warship. It is believed that Manjiro strongly influenced Meiji Restoration figures [[Sakamoto Ryoma] and Goto Shojiro, a Japanese politician and leader of the Freedom and People's Rights Movement, 自由見民権運動), both natives of Tosa. He taught naval science to Katsu Kaishu, and discussed the spirit of rationalism with Fukuzawa Yukichi. To the Japanese of the late Tokugawa and early Meiji eras, "America" was the America of Manjiro's descriptions. Manjiro helped to dispel many Japanese misconceptions about the United States, and especially devoted himself to teaching about American democracy, independence, freedom and equality. America's 30th president, Calvin Coolidge, was later to say, "When John Manjiro returned to Japan, it was as if America had sent its first ambassador. Our envoy Perry could enjoy so cordial a reception because John Manjiro had made Japan's central authorities understand the true face of America." Manjiro was married three times and had seven children. In early Showa, when Japanese-U.S. relations were deteriorating, America's 32nd president Franklin Roosevelt sent a personal letter to Manjiro's eldest son, Dr. Nakahama Toichiro, inviting him to the United States to act as a bridge in improving relations between Japan and America. Dr. Nakahama donated a valuable sword to Fairhaven in token of his father's rescue and the kindness of the town. It continued to be displayed in the town library even during World War II. Among his accomplishments, Manjiro was probably the first Japanese to ride a railroad, travel in a steamship, and to officer an American vessel. There is a large statue of Manjiro Nakahama at Cape Ashizuri, on Shikoku. In Fairhaven, the Manjiro Historic Friendship Society is renovating William Whitfield's home to include a museum dealing with the Manjiro legacy. Hasekura Tsunenaga, the first recorded Japanese to reach the American continent, in 1614. ↑ Korean History Project, Nakahama Manjiro, Korea in the Eye of the Tiger, Ch. 20, The Awakening of Japan. Retrieved October 9, 2008. ↑ The Manjiro Society, Introducing John Manjiro, Prof. Tetsuo Kawasumi, Keio University. Retrieved October 9, 2008. ↑ Virtualology, Manjiro Nakahama, Virtual American Biographies. Retrieved October 8, 2008. ↑ Michael Medeiros, Preserving the Manjiro Legacy, South Coast Today. Retrieved June 18, 2008. Bernard, Donald R. The Life and Times of John Manjiro. New York: McGraw-Hill. 1992, ISBN 0070049475. Kawada, Ikaku, Manjirō Nakahama, Junʼya Nagakuni, and Junji Kitadai. Drifting Toward the Southeast: The Story of Five Japanese Castaways: A Complete Translation of Hyoson kiryaku (A Brief Account of Drifting Toward the Southeast) as Told to the Court of Lord Yamauchi of Tosa in 1852 by John Manjiro. New Bedford, Mass: Spinner Publications, 2004. ISBN 9780932027597. Kawasumi, Tetsuo. Nakahama Manjirō shūsei. Tōkyō: Shōgakkan, 2001. Warinner, Emily V. John Manjiro from "Voyager to Destiny". Kōchi-ken Nangoku-shi: Tosa Bunka Shiryō Chōsa Kenkyūkai, 1970. Webber, Bert. Wrecked Japanese Junks Adrift in the North Pacific Ocean. Fairfield, Wash: Ye Galleon Press, 1984. ISBN 087770220X. This page was last modified on 6 November 2018, at 00:35.